Kimimaro was the last member of the Sound Five. Kimimaro is the sole survivor of the Kaguya clan. As the strongest member of the clan, Kimimaro was kept locked up at all times, only being released when needed for a battle. 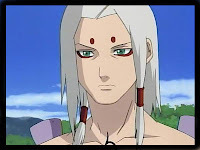 After his clan was killed, Kimimaro was found by Orochimaru. Kimimaro proceeded to develop a strong devotion towards Orochimaru, viewing him as the only person who cared for him. In his devotion to Orochimaru, Kimimaro stops at nothing to ensure the continuation of his master's dreams and ambitions. To this effect, he willingly kills any who oppose or hinder Orochimaru's progress, and even offers himself as a future host for Orochimaru's soul. 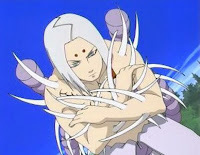 The Kaguya clan's kekkei genkai, Shikotsumyaku , gives Kimimaro the ability to manipulate his skeletal structure. An example of this ability is seen when Kimimaro fires his finger bones from his hands like bullets. Any injuries the skin receives during the process are instantly healed and replacement bones are created to restore the use of his hands. This ability can be used to sprout bones from any point on his body, giving him a quick defense against physical attacks by covering himself in spikes. Kimimaro can increase the strength of these bones to steel-like quality, a trait he often takes advantage of when using his bones as a sword. Each different purpose he has found for his bones he refers to as a specific dance, all of which are named after a plant. I just love the music from the first episodes! !